Our mission is, and has always been, to give our patients the best treatments and least invasive procedures possible to give them the smile they always wanted. 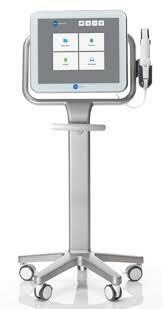 That’s why we are proud to announce the latest in dental technology in our office, the iTero Intraoral Scanner. With this latest equipment, Dr. Gashinsky is able to record topographical images of your teeth and oral tissue. Data generated from iTero can then be used in conjunction with the production of dental devices (such as aligners, braces, appliances, etc.) and accessories. 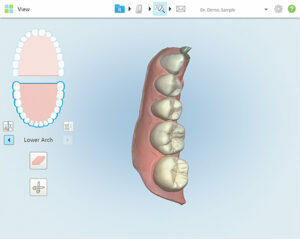 iTero Element software is used with the scanner to capture 3D digital impressions of your teeth, oral soft tissue and structures, and bite relationship. The software controls the processing of the data, so it can be exported to manufacture orthodontic devices and other dental accessories. In addition to scan data, the scanned images can be imported/exported or used for simulation purposes. In other words, you will be able to see the real-live transformation of your teeth when, for example, you plan to use Invisalign braces. • On-screen visulization in real-time allows for immediate adjustment to create the ideal orthodontic scan the first time. 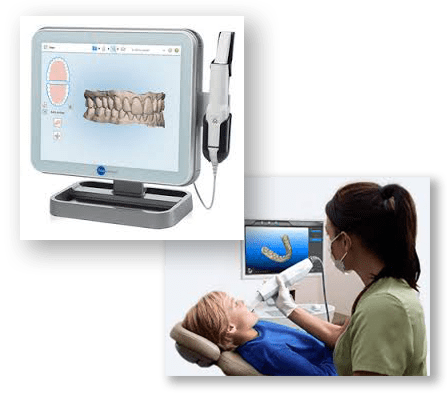 Dr. Gashinsky or one of our highly trained registered dental assistants uses the wand of the iTero Element Scanner to capture images of your tooth surfaces and gum tissue. This process utilizes only visible light and there is no exposure to ionizing radiation (x-rays). You can follow the scanning progress on the screen, since your orthodontic model is digitally built in real time. This eliminates the need to re-take impressions. The completed scan is available as a 3D model that Dr. Gashinsky can use to begin planning your treatment and to create supplemental orthodontic appliances or Invisalign® and Invisalign Teen aligners. Questions? Come in, or call us now at 973-379-9080 for an appointment!